Doha collapses - did you notice? How could this happen? How could it come about that anybody who blinked would have missed the news that the Doha Round of trade talks had collapsed -- and that even the people who noticed it mostly just shrugged and moved on? One reason is that the talks have indeed dragged on and on, and tracking the deviations of this epic of bureaucratic procedure would test the zeal of the most monomaniacal trade-policy wonk. But another reason, you might think, is that I am grossly exaggerating the whole thing, that the tale is not a clear-cut case of outrageous government incompetence, verging on criminality, as I am suggesting. But this would be incorrect. I am not hyping the evil and the idiocy of what has just happened. If anything, I am playing it down. Liberal trade works exactly like a resource-saving technology. So, it makes exactly as much sense for a country to deny itself the advantages of open borders to trade as it would to deny itself the use of personal computers -- another disruptive technology that shares its gains unequally within and among nations. Where my analogy goes wrong is that each government has its own liberal-trade machine, which it can switch on independently if it chooses. No international agreement is needed for a country to unilaterally lower its tariffs or cut its farm subsidies. If it does this, most of the gains (lower prices, lower taxes) flow to its own citizens -- but there are benefits for foreigners, too. For the past five years, each government has been refusing to switch on its own machine unless other governments switch on theirs first. Why should the United States help Europe and Asia, if Europe and Asia won't help the United States? And vice versa. In the end, this week, the governments agreed that the easiest thing was to forget the whole idea. When you put it like that, it just sounds crazy. It is crazy. Nonetheless, this is precisely what happened. Peggy Garvin, author of the soon-to-be-released "Real World Research Skills," is Blogger of the Month at Free Government Information (FGI). "Hollywood is a Washington for the Simpleminded"
Our next Capitol Hill Workshop, scheduled for September 13-15, 2006, is for anyone whose work requires that they have a broad understanding of Congress and Capitol Hill. Capitol Hill Workshop materials include the Congressional Directory and the award-winning Congressional Deskbook. This CQ Executive Conference is approved for 1.6 CEU credits from George Mason University. Prescription drugs currently account for well under 20 percent of the health-care budget. Within a generation or two, they will undoubtedly account for most of it--which will be another good thing. Pharma’s biochemical cures always end up far cheaper than the people-centered services they ultimately displace. Moreover, while much hands-on care only drags things out or soothes, the best medicines really cure. It is true that, early on in the pharmacological assault on a grave disease, drugs also stretch things out and can fail to beat the disease, so we often end up buying more drug and more doctor, too. But eventually drugs improve to the point where they beat the disease and thus lay off both doctor and hospital. When people say America's future will look like Las Vegas, they usually mean there will be fewer jobs in manufacturing and more in services. But the city also provides an example of how (and how not) to cope with the boomers surging past 60. The casinos are scrambling to compete for the boomers' money: hence the parade of crooners of a certain age and a show called “Menopause—the Musical” at the Hilton. Many boomers retire to Las Vegas because they so enjoyed holidaying there. When they first arrive, they are typically “young-old”, healthy and relatively wealthy. Their spending boosts the local economy, especially if they can afford spa treatments and dog-washing services. But as they age they will start, as a group, to demand more public services. 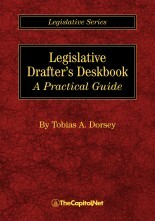 Toby Dorsey's book, Legislative Drafter's Deskbook, to be published next month (it's making its way - finally - next week from the printing plant in Michigan to the bookbinder in Massachusetts), is getting more positive reviews. Overall the author produces an informative and effective work that provides readers with a detailed introduction to the thoughtfulness and importance of drafting legislative statutes. This work is so highly informative to someone foreign to the drafting process, that it must also stand a useful daily guide and reminder to actual drafters. The Legislative Drafter's Deskbook clearly has a place on the bookshelves of practitioners and scholars alike. For a page of resources for legislative drafters, see Legislative Drafting Reference and Research Tools. This Week in DC Reviews is a roundup of reviews of DC-area restaurants, with quick links to DC-area restaurants that sound interesting to us. To see a list of upcoming food events in the DC area, see "Washington, D.C. Wine Tasting, Dinners, Food/Drink Events." For a Guide to restaurants in the DC area, see Tyler Cowen's Ethnic Dining Guide. For a roundup of "good value" New York City restaurant reviews, see This Week in NYC Reviews at A Guy In New York. We know that great dining can be had at many restaurants across the pricing spectrum here in Washington ... from inexpensive places such as Bob's Noodle 66 ... to the more expensive such as Oceanaire ... and with Summer 2006 Restaurant Week coming (August 14 -20, 2006), there are even more affordable places to explore ... Bon appétit! Shut the windows and crank up the A/C, and keep an umbrella nearby. Characteristic (but not extreme) DC summer heat and humidity, and the threat of late afternoon/evening thunderstorms, kick in today and should persist through much of the week. This Week in DC Reviews is a roundup of reviews of DC-area restaurants, with quick links to DC-area restaurant reviews and mentions from the previous seven days in blogs, magazines, and newspapers. For a Guide to restaurants in the DC area, see Tyler Cowen's Ethnic Dining Guide. For a roundup of New York City restaurant reviews from NYC food bloggers and media, see This Week in NYC Reviews at A Guy In New York. For a book I was writing about a school for exotic animal trainers, I started commuting from Maine to California, where I spent my days watching students do the seemingly impossible: teaching hyenas to pirouette on command, cougars to offer their paws for a nail clipping, and baboons to skateboard. ... throw him a mackerel. The Virginia Declaration of Rights was "Written by George Mason (1725-1792), who Thomas Jefferson regarded as the 'the wisest man of his generation.'" The Senate Commerce Committee deadlocked 11 to 11 on an amendment inserting some very basic net neutrality provisions into a moving telecommunications bill. The provisions didn't prohibit an ISP from handling VOIP faster than emails, but would have made it illegal to handle its own VOIP packets faster than a competitor's. I got a copy of the internet that Senator Ted Stevens's staff sent to him, and which, as he told the full Commerce Committee as proof that net neutrality was bad, took almost five days to get to him because the internet's pipes were so full of traffic. I admit to a little skepticism, so I asked the Senator's office to send me a copy of the internet via Fed-Ex (to avoid internet rush hour). After signing for it this morning, I unwrapped it and set out to test it forensically to make sure the senator was telling the truth (turns out it was just an internet letter, not an entire internet). After his staffers sent the internet letter and the letter shattered into pieces by the internal sledgehammer encased in the congressional mail server, the pieces were slingshotted into the internet's pipe (to visual this, think of how a potato gun works and then simply reverse the process in your head). Ryan Singel discovered that one packet of Senator Stevens' Internet got wayalid "after bumping into 419 packets which all claimed to belonging to a family member of a recently deceased Nigerian finance minister and over a period of three days, the packet gave away all of its contents to a fake bank in Nigeria in hopes of striking it rich. One other packet got sandwiched in Norfolk, VA between a YouTube video of a cat adoption video gone bad and a Google Video of a carbon fiber mountain bike disintegrating under its rider. After splitting itself in two from laughter, the packet was sued by the recording industry since one of the maker's of the videos once downloaded a Britney Spears song as a joke." Not to mention bumping into all all those peskey packets at ScamORama, The Lads from Lagos.